Description: Do you have what it takes to make it across our newest interactive, Leaps N Bounds is our newest inflatable were the objective is to make it across with out falling off. 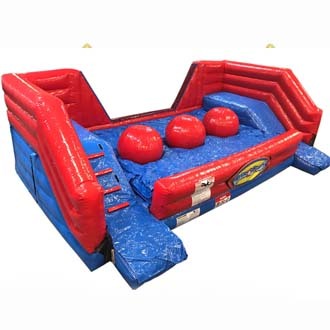 This Leaps N Bounds inflatable is perfect way to keep you event guess entertained. This inflatable is very big in size, measuring 30' length x 12' height x 14' Width. Don't forget to check out our large selection of inflatables, we also have many new carnival games, and new concession machines. some of the towns in our free delivery area are Paramus NJ, Garfield NJ, Elmwood Park NJ, Fair Lawn NJ, Franklin Lakes NJ, Wyckoff NJ, and many more town in northern NJ where our inflatable rentals have free delivery.